"Grant Not, O Lord, the Desires of the Wicked"
Children did not escape the horrors of the holocaust. Over 1.5 million children were killed in the barrage of mass murder and extermination. Less than 10% of Jewish children survived the Nazi regime's occupation of Europe. 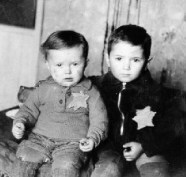 Children were forced to wear a star to publicly denounce their Jewish heritage. Many were seized from their homes and thrown out of windows by their hair into deportation trucks. Many children perished due to deliberately induced starvation, harsh cold and disease. Children were not spared any of the suffering and torture experienced by adults. In particular, because children could not obey verbal orders and perform hand labour, they were dealt with more harshly. Children experienced the same ruthless cruelty as their adult counterparts. They were not spared humiliation, stigmatisation, segregation, overcrowding, round-ups, deportations, concentration camps, slave labour, medical experimentation, torture, mass shootings or murder. Oldtymestockings remembers the children who perished in the holocaust. 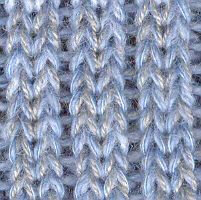 Soft blues are interknit with gold to produce a colour scheme you will certainly enjoy. As soft as the cheeks of children and as beautiful as their smiles, these Freedom Trail Socks are composed of 100% merino wool. Oldtymestockings Shades of Blue socks are available in ankle, mid-calf and knee lengths. Support the mission to obtain world peace. Place your order for a pair of Oldtymestockings Jewish Holocaust Shades of Blue Socks today.